Sunsetter Retractable Awnings | Harrison Township, Michigan | St. Clair Awning Co.
Providing Awnings for Over 25 Years! Our sales and installation staff has been in the awning business for 26 years. As a licensed Builder in Michigan since 1980, we will insure a proper installation of your new SunSetter Retractable Awning. Please call us for your personal in home consultation, or visit our showroom on Jefferson Ave in Harrison Twp. We have the SunSetter Motorized Pro, Motorized, and Vista manual crank models on display. We serve most of SouthEast Michigan and look forward to hearing from you. 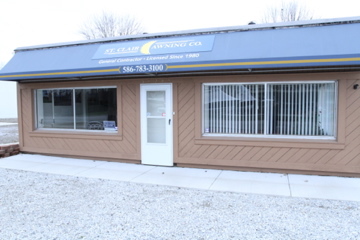 Call St. Clair Awning Company Today!